I don't think "Trusting in the Lord" means wandering around with a stupid grin on yer mug, waiting for instructions from burning bushes, or your neighbors dog. Jesus said, "do not be anxious about your life...."
That doesn't mean don't prepare for emergencies, or for the eventualities of retirement. That's just being wise...not anxious. Proverbs 3:5 "...and do not lean on your own understanding." Is this really what the writer was speaking about concerning this passage? God gave us a great big brain, and somewhat of an ability to use it. So called "common sense" tells me to have a fence around my yard to keep my big guard dog in...or do I "trust in the Lord" to make sure fido doesn't chew on passerby's? Should I put gasoline, or diesel in my Jeep? I trust that God's promises will come true. I trust in my salvation, he again, has promised. Short of that, the mundane daily acts of life I should be adult enough to muddle through myself, not being a babe always suckling at the milk, but rather growing...and having at the meat. You're right in saying that "trusting in the Lord" doesn't mean wandering around with a stupid grin, nor does it mean that we don't do some form of preparations for tomorrow. Of course God gave us a brain, which I would say implies that He expects us to use it. I'm not talking about the stupidity of gas versus diesel or work versus motorcycling. But if you re-read what I wrote, you would see that too. What I was referring to is the apparent contradiction between what God says in the Bible, and the accepted normal worldview (sometimes called common sense) of an atheistic and God-less society. When that happens, I will side with God's view and opinion every time, regardless what the world thinks. I know the world often thinks that is foolish. Interesting, though, is that God has said time and again that the worldview (common sense mentality???) is what is really foolish when it is in contradiction to His view. I hear what you're saying, but sorry, God's Word trumps all others in my book, including yours and mine. If He says in Proverbs 3:5, "Trust in the Lord with all your heart and do not lean on your own understanding," then I take that to mean exactly that and not some other illogical thing. "With all your heart" implies a level of trust that goes way beyond an intellectual assent and is actually a very deep settled conviction and reliance on God alone. Likewise, in the context of seeking wisdom, "do not lean on your own understanding" is simply saying that the truly wise person will govern themselves, not by the often mistaken "common sense" of the world, but rather by what the Lord Himself declares to be truth. Blessings, and thanks for your comment. "What I was referring to is the apparent contradiction between what God says in the Bible, and the accepted normal worldview (sometimes called common sense) of an atheistic and God-less society." 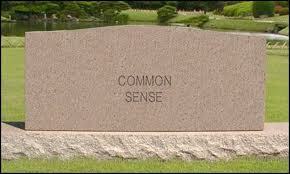 I would put forth that "common sense" is..ah..not really that common. teehee. A natural man has no understanding of spiritual things, of the things of the Gospel, nor indeed any understanding of things moral, Romans 3:11, Jeremiah 4:22. The understanding of man is darkened by sin. So yes, I will choose God rather than men's worldviews. To do otherwise will only bring heartbreak, and madness. Of course, in doing so, we will be mocked, and held to be foolish, as our actions/decisions appear to violate the "common sense" of a fallen world. Cheers, I leave you in the grace and favour of the Lord. I just want to say how much I appreciate your comments, not just on this post, but previous ones as well. You have a way with words that personally I find refreshing. Thank you for that.